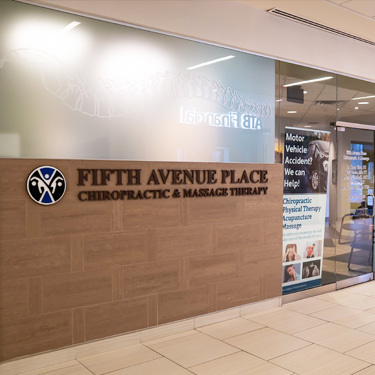 Fifth Avenue Place Chiropractic & Massage brings together a variety of health care professionals for a diversified and effective treatment of many health conditions. So much of the medical world looks at you as a number. We strive to change that. Our clinic has a family-run feel while being professional. We offer our best care, which means getting to know you. In our office, you are not a number; you have a name and a story. We look forward to getting to know you. Chiropractic is an amazing art as well as science, and for those looking for an answer to a health problem try it. You will be amazed by the results. Our Downtown Calgary clinic offers Chiropractic Care, as well as Active Release Techniques, Acupuncture & Traditional Chinese Medicine, Therapeutic Massage and Reflexology. It is our goal to find the therapy best suited for your body’s needs. We offer an integrated treatment approach where all practitioners are involved. You have a history here and we will strive to ensure your return to good health. At Fifth Avenue Place Chiropractic & Massage we maintain a simple philosophy; your health is our number one priority. Together as a team we will help you achieve your goal. Take the first step towards relief by calling our Calgary practice today and making an appointment to discuss your health goals.